In support of electronic cigarettes, and its users, I would like to promote a standard, that contains light touch 'guide to best practices' is based on the latest evidence, welcomes (even encourages) innovation, protects small business, and users. I can better do this if able to attend IEEE meetings, and present evidence, to show other members of the benefit from electronic cigarettes. 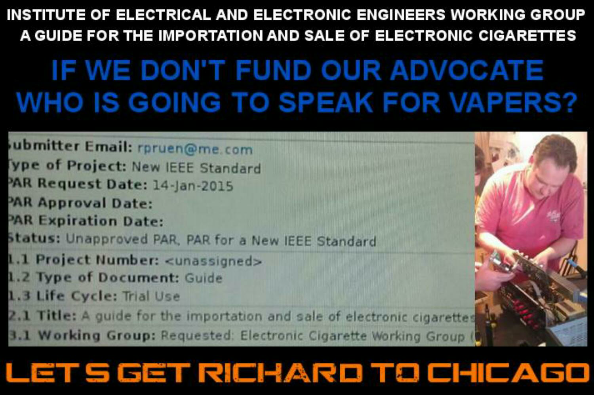 All donations will be used in line with IEEE codes of ethics, to support efforts for the good of every person, who can benefit from electronic cigarettes. I've been asked to add a bit about why I'm doing this. I believe that we vapers need to write our own standards to balance safety, and keep innovation alive and well. Others would regulate us out of existence, that can't be allowed to happen. A worldwide standard will go a long way to providing something to show safety is taken seriously, and if written by a vaper, will not over regulate things. To do this I need to attend meetings and promote this standard, because failure is not an option. The standard will be written by a working group, made up of users, vendors, and manufacturers. I truly want this to be the best thing for all of us. Thank you again for your support, I and the vaping community, value your donation! Hi everyone, to try and make best use of your funding, I'm going to arrange an interview with science sort of.... Podcast while in the states, hopefully this will help get the word out, as well as give the listeners an interesting new topic. The listeners range from scientists to interested members of the public. Thank you for uploading your paper 1570083737 ('Electronic Cigarettes, the past, present, and future') to 2015 IEEE Symposium on Product Compliance Engineering. Thank you for your efforts on our behalf, Richard! The best of luck in Chicago Richard and thank you.